Sun Mines Electrics Co., Ltd. - Sun Mines has a leading company in Taiwan regarding pumps on is industrial and domestic applications as well as in the fields of water aeration. 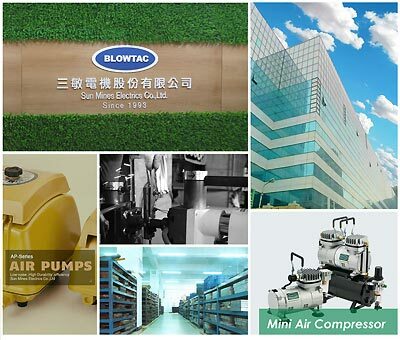 BLOWTAC / Sun Mines has a leading company in Taiwan regarding pumps on is industrial and domestic applications as well as in the fields of water aeration. We offer the shortest lead time 3-7 days for standard unit to reduce the stock cost of client. The RD. people focus on revising standard unit or new design of products for clients to meet the market demand. We offer wide range of equipments to meet the client needs in each order. Established in 1993, Sun Mines has good and efficient in OEM or ODM products development at good quality and competitive price by our R&D and production line teamwork. Quality, Innovation and Service is our reality to satisfy our customers with best market strength in their business. Mini Air Compressors For Your Needs!